Televisions and peripheral devices often consume energy even when they are not in active use. They draw power in standby mode, allowing them to receive a signal from a remote control, perform recording functions, and maintain internet connection. This article was published by the US Energy Information Administration on Sept. 6, 2018. Results from EIA’s 2015 Residential Energy Consumption Survey (RECS) show that televisions and related peripheral devices—such as digital video recorders (DVRs), video game consoles, and streaming devices—consumed 7 per cent of the electricity used in American homes in 2015 and cost $103 per home per year to operate. Peripheral device consumption accounted for slightly less than half of this electricity consumption, collectively using almost as much energy as televisions. The new RECS data also provide insights into the consumption of the most-used and second-most-used TV in a home. RECS asks respondents detailed questions about their two most-used televisions, such as how many hours they are turned on, the size of the display, and the type of screen. This information informs the models used to estimate television consumption. In homes with more than one TV, the most-used TV consumed more than twice as much electricity as the second-most used TV. 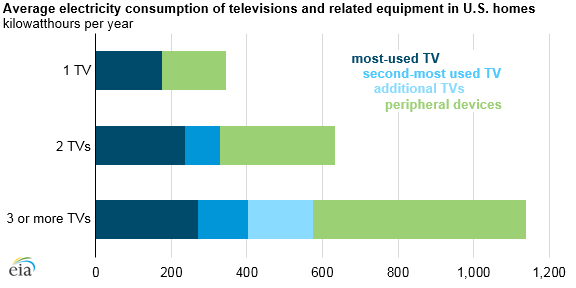 In addition, energy consumption of the most-used TV was higher in homes that had more than one TV. In homes with more than one TV, the most-used TV tended to be larger and was turned on for more hours each day. The RECS end-use category of televisions and related equipment aggregates the electricity consumption of televisions—which are found in 97 per cent of American homes—with the electricity consumption of seven types of peripheral devices. Many of these devices may perform multiple functions, such as cable or satellite boxes that include a DVR or video game consoles that can connect to internet streaming services. 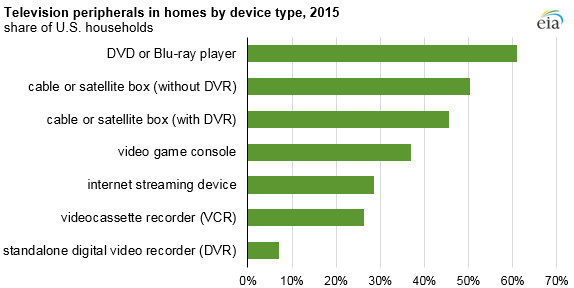 Of the devices surveyed, DVD and Blu-ray players were the most common, present in 61 per cent of homes. Cable or satellite boxes without DVR capabilities were the second-most common, found in half of all homes. Separate DVRs were the least common, present in only 7 per cent of homes. The 2015 RECS was the first time the survey asked respondents about Internet streaming devices that allow users to view media from the Internet on their TV such as Roku and Apple TV; 29 per cent of respondents reported having such a device. On average, homes with a television had a total of 3.9 peripheral devices, or 1.6 devices per TV. Although they may perform the same functions, some peripheral devices can be much more energy efficient than others. For instance, internet-enabled smart TVs are the most efficient way to stream media compared with streaming devices or game consoles being used for the same purpose, according to analysis by the Environmental Protection Agency’s ENERGY STAR program. ENERGY STAR-certified televisions are on average 27 per cent more energy efficient than televisions that are not certified. Features such as highly efficient lighting technologies, default brightness settings less than the maximum, and automatic brightness control make televisions more energy efficient. One of the requirements to be ENERGY STAR-certified is that a television must consume 3 watts or less when in standby mode. You can find more information on household energy consumption and expenditures in the RECS data tables and microdata file.